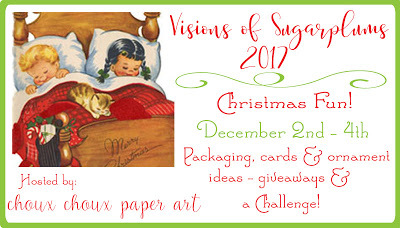 Welcome to day 4 of Paper Sweeties wonderful 25 Days of Christmas. I hope you've been joining us every day this month on the Paper Sweeties Blog for the links to all the FABULOUS inspiration being shared on the blogs of my talented teammates. 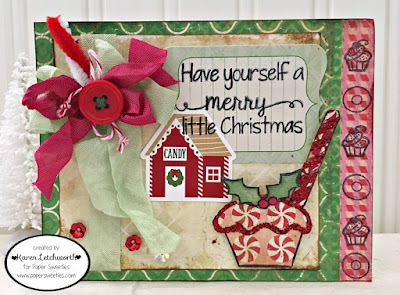 For today, I'm sharing this sweet Christmas card I created using a few of my favorite Christmas sets from Paper Sweeties. I started with some fun patterned papers, and I used the Tackle Life One Cup at a Time stamp set to add the sweet cupcakes and donuts to the right-hand border of my card. Today is also Day 3 of Lori Hairston's Visions of Sugarplums Blog Hop and Paper Sweeties is one of the sponsors for this fabulous event. It's true! One lucky person will win some Paper Sweeties goodness of their very own. Lori always has lots of fun and inspiration during her events, so be sure to stop by and see what it's all about here on Lori's Blog. I ran a piece of Mint Seam Binding down my card, and also tied a bow with the Mint Seam Binding and Strawberry Seam Binding. I also tucked in a small piece from a Red & White Cenille Candy Cane. I stamped the cupcake and glittered candy peppermint stick from the super sweet Homemade With Love stamp set. The sentiment is from the brand new You Better Not Pout stamp set. Cute, sweet, yummy and adorably creative fun! That's what you'll find at Paper Sweeties! By the way, the little candy house is just a sticker (in case you were wondering). I also added some Strawberry Sequins and Sugar Sprinkles Sequins near the bottom of my card. I like to add Sequins because they are SO super cute, and they add so much fun to my cards. Not to mention, they come in so many fabulous colors that you're sure to find just the right color for your next project. 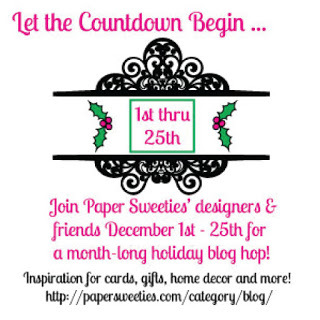 Don't miss out on a single day of Paper Sweeties 25 Days of Christmas. 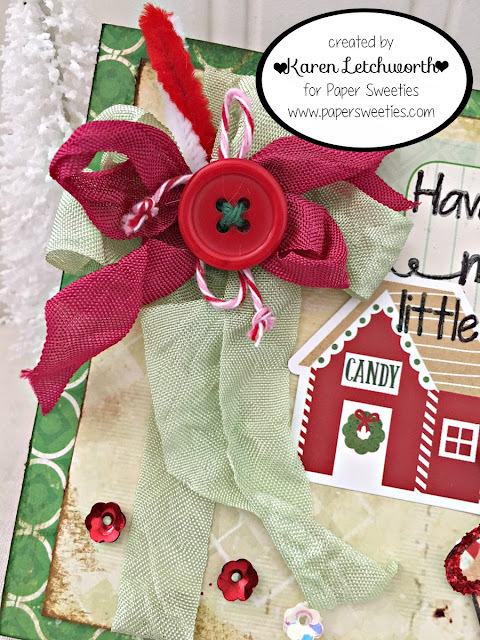 Tomorrow my creative friend Lori Turner will be sharing a special Paper Sweeties Christmas project using some of her most favorite Paper Sweeties Christmas products. 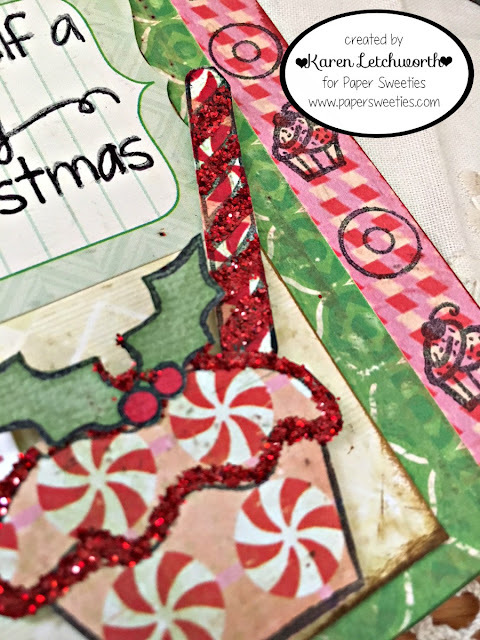 I really encourage you to stop by Paper Sweeties every day to see what's new! SPECIAL TODAY - You can get 50% OFF all seam binding at Paper Sweeties by using coupon code RIBBON. Dies R Us Challenge #86 - Christmas Carols. 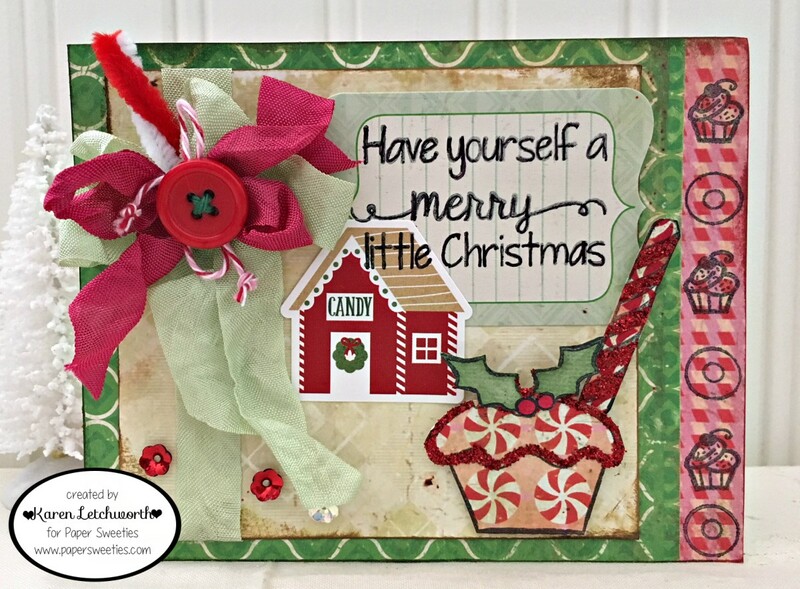 First, I used several dies from Paper Sweeties (the cupcake and candy stick) and the Christmas Carol I based this card around is in the sentiment...."Have Yourself a Merry Little Christmas". Love the sparkles and glitter you added to your sweet card, Karen! So pretty! Eye candy!! My sweet tooth is tingling in seeing all these yummy images on your card! Festive fabulous! Thank you, once again, for the wonderful inspiration! So pretty, Karen ... love the bling you added with sequins and glitter!!! Such a sweet Christmas card! Love the pretty seam binding ribbons and that cute little house and all the glitter on the cupcake. So fun! Super cute and love the touch of the sweet seam binding and the sequins! Have enjoyed the bloghop visits, you always have yummy cupcakes. Still wanting to win some new stash and thanking you for the fun during this hop. sweet card. love the sparkle! Awww, this is precious, Karen! Love your colour combo and that adorable cupcake! Beautiful ribbon too! Thanks for inspiring these last few days! I've enjoyed the hop! Love the glitter and ribbons on your sweet card! Ooh, how CUTE Karen! What a Fun Whimsical card! Karen, your card is just adorable. I love how cute this looks Karen! The little house is so sweet! Oh how I love your card Karen! The mix of pattern papers looks wonderful along with all the sparkle! This is adorable and perfect for the Visions of Sugarplums. I would love to WIN a prize. Wonderful design full of texture and dimension. Thanks so much for sharing it with us at Dies R Us Challenge Blog. So cute, Karen--gorgeous elements! I really love the mint & red seam bindings together! ADORABLE! Thanks so much for playing in our ‘Christmas Carols’ challenge at Dies R Us! Please come back again soon! Sweet card! Love that cupcake!